DRIFE is a completely decentralized ride-hailing platform powered by the EOS blockchain with the intent of empowering value creators within our ecosystem — these include the drivers, riders, and community developers. DRIFE plans to disrupt the existing business model and remove the corporate intermediaries involved in the transactions. What we've created in the DRIFE ecosystem is a new paradigm for the ride-hailing industry. We are the first platform in this niche to express the full features of the decentralized ride-hailing economy. A. 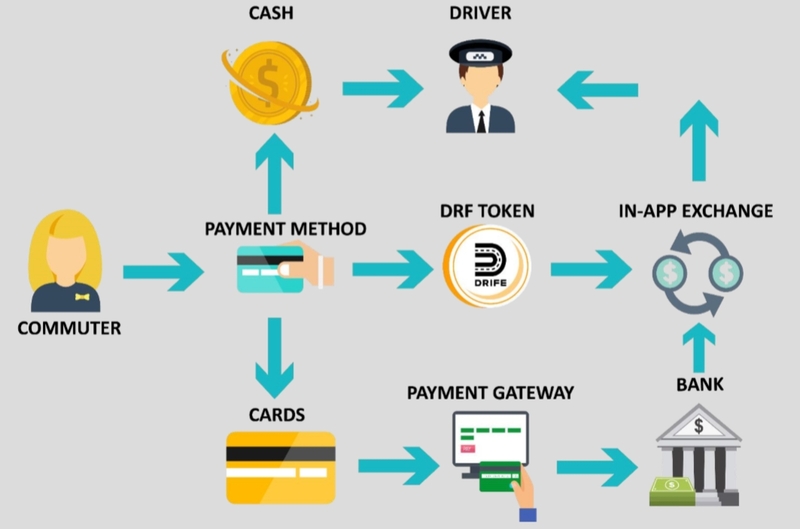 Drivers: DRIFE aims at shifting the focus from the existing commission-based platforms to a decentralized network with a new economic model, where 100% of the fare paid by 'Rider' goes directly to the 'Driver'. We at DRIFE are determined to make an economy of Zero commission on rides, only annual Membership Fee from the driver which will give them access to DRIFE platform to get connected with the riders. The platform fee can be paid in either DRIFE token or Fiat currency and will accrue annually, with the first year Membership Fee paid by the drivers acting as a security deposit. Drivers will be given equivalent DRIFE tokens, which is locked into the DRIFE platform as long as the Driver remains in the community. Anytime the driver wants to exit from the community, they will be free to liquidate their DRIFE token for themselves. The second-year membership fee will give drivers access to DRIFE platform only with no DRF token equivalent given. Funds collected through membership fee will be used for pay day to day expenses to run the platform. B. Riders: passengers receive special exclusive discounts (T&C applies) when DRIFE tokens are used to make payments for trips. Further, as incentives and bonuses when they behave appropriately during rides. More so, feedbacks on the driver, trips, overall DRIFE platform use, and network building are incentivized through the DRIFE token. C. Developers*: a community of open-source developers are incentivized through bug bounties and for other potentially creative in-app developments that will user experience through UI interaction for both riders and drivers. D. Investors*: it's our desire that our product will have an indirect impact on adopters 'outside' our user ecosystem. This will include long-term investors, traders on both decentralized and centralized exchanges and all future potentials the DRIFE token will have as a result of interaction with our product and is adaptability. Incentives here will involve periodic airdrops, self drops, and air grabs. More so, staking rewards are competitive and far beneficial than what is currently obtainable on other decentralized projects. In summary, our economic model encourages active participation from the community members towards the building and maintenance of the ecosystem. Decentralization aims at shifting the focus from a central authority to the driver partners. With the power of the Blockchain technology, the DRIFE platform strives to bring a new paradigm to the ride-sharing scenario and solve the horde of issues that have emerged from the current model of centralized business. The growth of the platform not only contributes to the objective of DRIFE but also enhance the overall value provided to all the stakeholders concerned like driver's income, rider's fare, cybersecurity, and transparent governance. Our aim is to eliminate excessive transaction fees, reduce censorship (reduce interference from DRIFE side) and redistribute value back to the community, enhance transparency and return governance responsibilities back to the community. The DRIFE platform is developed with the intention of solving the current concerns in the drivers' community, alongside enhancing the quality of rides for the customer. 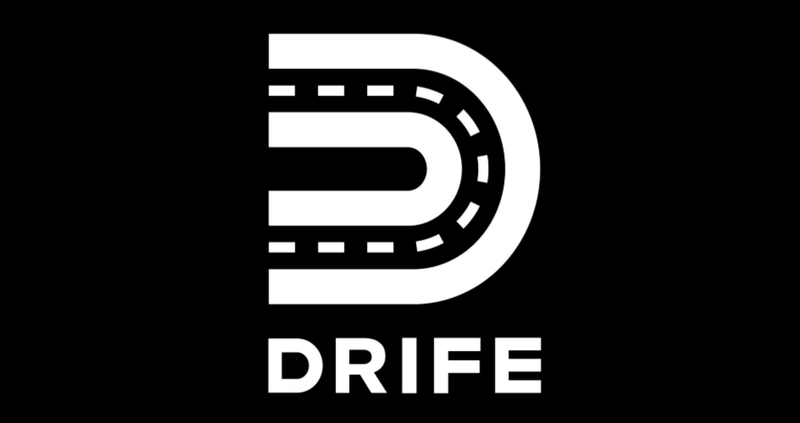 Drivers are given incentives to introduce new drivers to the DRIFE platform; which will in turn help to form a social community of drivers, owned by the drivers themselves. The result is a disintermediation of payment to any intermediary between the driver and the customer. This will inspire the new drivers to recommend other drivers until a critical number of drivers as defined by the network are present on the DRIFE platform. Drivers using the DRIFE platform will be able to build and foster the growth of their own fleet of drivers. This encourages all drivers on DRIFE to start a new business for themselves, as entrepreneurs by becoming a DRIFE partner gaining individual income, without sacrificing any earnings in the form of commission. For example if 'A' is an existing driver on the DRIFE network and suppose he refers 'B' to the platform. 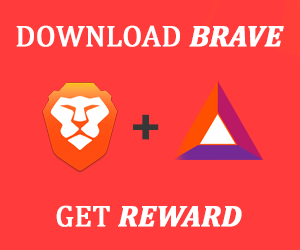 A will be entitled for a certain amount of free DRF tokens on successful on boarding of B to the DRIFE platform. Moreover, once 'B' starts getting ride and makes a trip for $100, then A will get $1 as 1% commission. The commission received by an existing driver can be viewed in the Commission wallet, from which drivers can withdraw at consistent intervals. Blockchain implementation creates a fully auditable and valid ledger of transactions that is indelible and unforgeable. With a user-friendly interface to access the same, transparency in payments and fare calculations can be achieved. DRIFE ecosystem leverages a 'No Surge Price' model to sustain rider's loyalty and create sustainable income for drivers by paying them additional incentive during surge time, which will be tracked using a heat map, which will get activated when demand is greater than demand. DRIFE Services API: Node.js server with Express.js. DRIFE is built over EOSIO. EOSIO is an open-source blockchain software protocol that provides a platform to build, deploy and run high-performing decentralized applications (DAPPs). For consensus over messages, the EOSIO architecture uses Delegated Proof of Stake (DPoS). 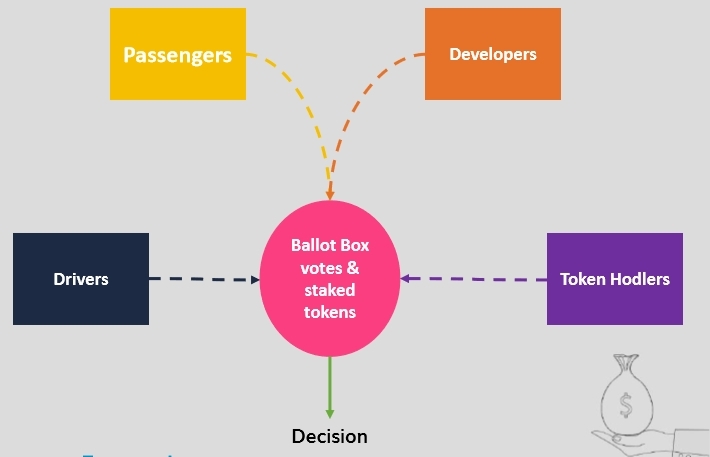 DPoS is a two-tier governance structure proven in Steem and Bitshares. DPoS is not only more energy efficient and environmentally friendly than consensus mechanisms like Proof of Work (PoW) implemented in Bitcoin and Ethereum, but way faster too. EOSIO based blockchains execute user-generated applications and code using Web Assembly (WASM). WASM is an emerging web standard with widespread support of Google, Microsoft, Apple, and industry-leading companies. 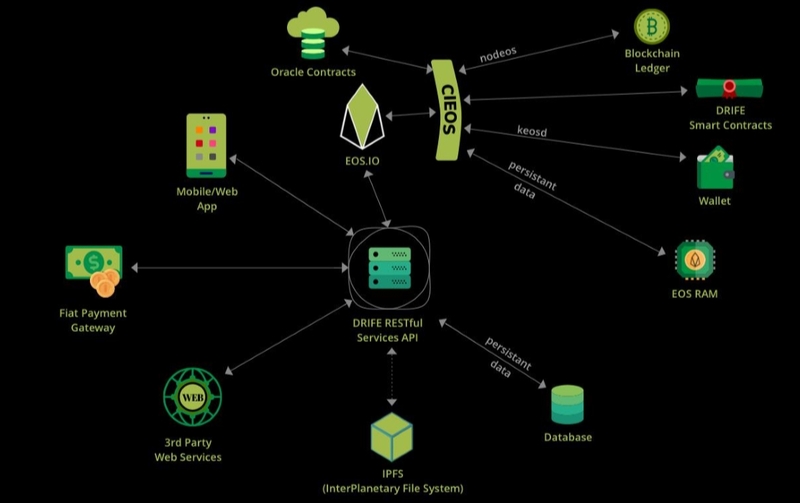 The EOSIO C++ toolchain is being used for building contracts for DRIFE that will compile to WASM. Figure above depicts the flow of payments within the DRIFE network. DRIFE will allow payments via cash, cards, and DRF tokens. This gives the commuter access to different payment options and choice. For every trip, the fare is paid 100% directly to the driver and thus, ensures that DRIFE has no hidden cost, charges or commission. 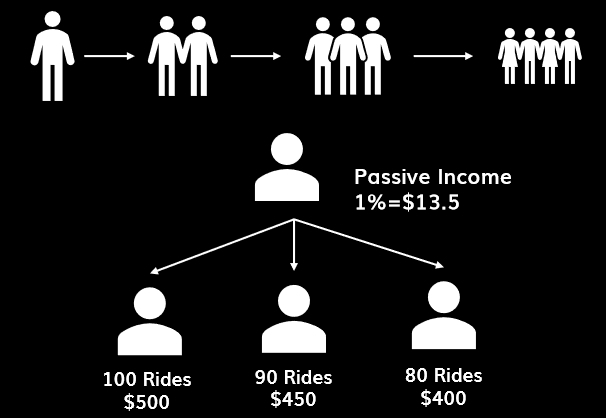 This 100% fare payment to the driver offers major cost benefits when compared to competing ride-hailing systems and returns all revenue back to the community where it belongs. At the core, DRIFE is essentially decentralized to return power back to the value creators and making the ecosystem profitable to all stakeholders. DRIFE uses the blockchain to establish trust through smart contracts, transparency, and reliability of data security. 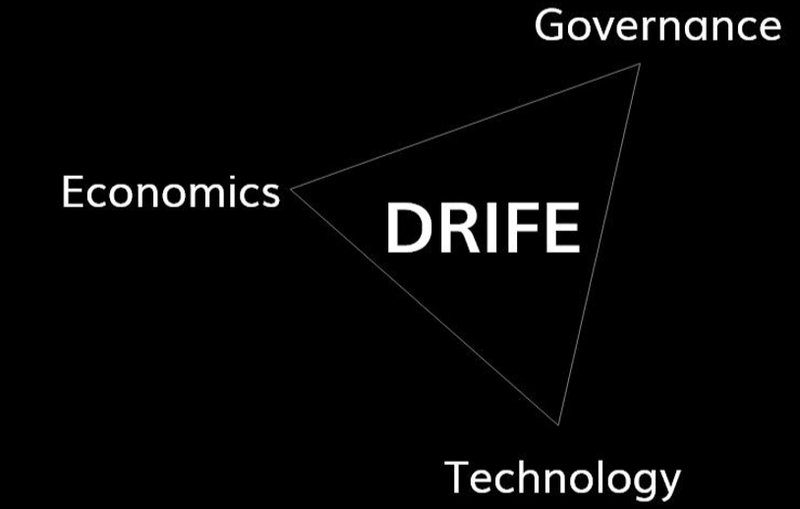 The DRIFE architecture incorporates the Governance, Economics, and Technological (GET) infrastructure model to solve all the aforementioned problems within the ride-hailing industry. The GET model encompasses a wide array of autonomous solutions, and fused with blockchain characteristics, it becomes a powerful disruptive tool within the industry. DRIFE believes in a democratic voting mechanism depending on the number of tokens staked at that moment. The more the tokens staked, the higher the weight of voting. This is essential to take care of the problem of centralization and becomes useful during any decision-making. Our governance model solves the problem of centralization, price surge, and sustainability through a stable decentralized governance structure. At DRIFE we value the inputs of the community and therefore, we transfer the development power to the community that will use the platform. It seems to be the best course of action since the community using the platform will eventually have first-hand engagement with the product and interact with other community members. The highlight of our economic model is the 100% ride-fare which is paid to the driver either in DRIFE tokens or in any other currency/cryptocurrency. Our financial model takes care of the problem of income generation for drivers and incentivizes other stakeholders to participate in the building of the ecosystem. As would be discussed later on, the DRIFE token represents a utility token which will power the platform and create economic value as it serves as both a currency to pay for a ride and as a tradable utility on the currency market. It's a given that all stakeholders in our ecosystem are somewhat vested in the project for economic empowerment which is inclusive of financial gains. Part of our goal is to encourage participation and incentivize each member of the contributing community proportionately. Our economic model focuses on the core value creators within the ecosystem: Drivers, Riders, Developers, and Investors (adopters). The blockchain is being touted to become a decentralized operating system which can support industrial-scale decentralized applications. Though the technology is still nascent, still many of the products available on the open market today, reveal a high level of evolution that has taken place within a very short period of time. While there are many development environments for decentralized applications (dApps), different blockchains have their specific strengths and weaknesses and most share laxitiesIA on the side of scalability and flexibility for developers. DRIFE apps will be available for IOS and Android. This will be the interface for all riders and drivers using DRIFE platform and will be focused on usability and instinctiveness. Mobile apps will be developed to be compatible with the maximum number of Android and iOS devices. DRIFE Mobile Application is built using React Native. User signup and login is achieved using Google Firebase Authentication. Soft cap: 32,500,000 DRF (20%). After the ICO these utility tokens are not just restricted for services but also sold on exchanges. The Driver and rider bonus tokens are to encourage loyalty from DRIFE customers, this will be distributed to the early adopter of DRIFE APP for commuting, and this is given to both rider and drivers for adding new people to their network. All funds contributed as part of the pre-sale will be used for development, testing and release of Minimum Viable Product (MVP). Furthermore, these funds will be used to support community building campaigns. Funds contributed as part of ICO will be spent on rolling out the final version of the platform and its mainstream adoption. Areas on which ICO funds will be spent include product enhancements (including bug bounties), 3rd party audits, testing, marketing and reserves for any possible contingencies. From the 325 million DRIFE tokens to be created, 32.5 million will be held by the DRIFE Technologies, which is based in London, United Kingdom. The company will hold these tokens in a time-locked escrow account for 10 years. This is done to align DRIFE Technologies interest with those participating in DRF token distribution As a major holder of the token, the foundation's long-term success depends on its active participation in the expansion of the token, so that the high return may fund further outreach and reward all users of the platform. Firdosh Sheikh has over 5 years of industry experience leading large teams in Capital Market and IT industry. An early blockchain and cryptocurrency investor. Her background in professional business, IT and finance give her a passion to bring a creative approach to the often-mundane business world. Firdosh loves to help her team to see their innovative idea come to life. Surya Ranjith has over 3 years of industry experience in hedge fund management project and has demonstrated a history of working in the capital markets industry, he has also worked on blockchain implementation in the finance industry. 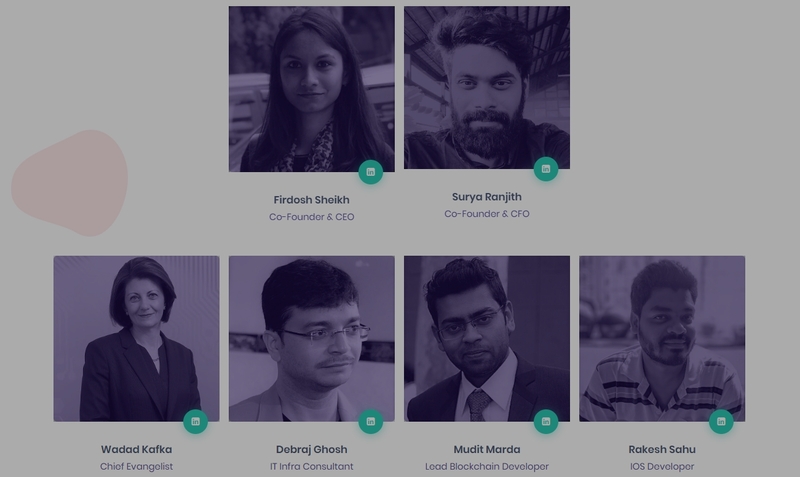 With an experience of aiding in implementing blockchain solutions for capital industry, Surya brings in expertise and technical know-how to DRIFE. To stay up to date on DRIFE news and announcements, subscribe to Medium and Steemit channels, follow on Social Media and Twitter, and join the conversation on Telegram.